In it, Prince Ivan encounters the Wolf, who promptly eats Ivan's horse. 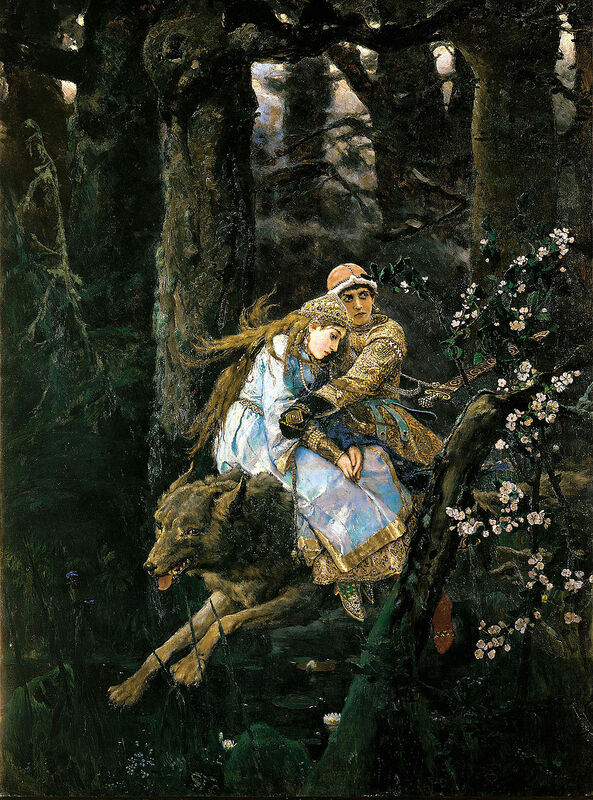 To pay back his debt to Ivan, Wolf agrees to serve as his mount, and they go on adventures. They meet the Firebird, save a princess, and run afoul of Ivan’s brothers, who betray and murder him. The Wolf himself turns out to be magical; he proves his friendship by resurrecting Ivan and helping him exact revenge upon his siblings. It’s lovely and grim, and struck me as a particularly fun mashup of a buddy cop/road trip story. I liked Ivan and Wolf so much I wrote a short roleplaying game about the pair, and later made a short puppet film as well. Bringing fantasy Russia to life on a tiny scale! Of course, my version was different. I genderswapped Ivan for Ivanna (but kept her just as reckless and adventurous). And I added frost trolls and a Winter King – a kind of Unseelie fairy lord who wants nothing more than to encase the world in ice. In her first adventure, Ivanna and Wolf are at odds over the death of her horse, but eventually make amends when both come under the spell of an evil shapeshifting witch living in an old, monstrous tree. Later adventures were to feature Ivanna meeting up with an evil sibling who does, indeed, kill her...forcing Wolf to work with the witch’s former familiar – an irksome raven – to find a cure in the headwaters of the River of Life. I still want to tell that story! And others! Once Upon A Time lets me tell them. As much as we’d like to, my friends and I can’t necessarily commit to six months or more of production on a film, even a short one, every time we want to spin one of these yarns. But we can get together every couple weeks for a game night. Take the core Once Upon a Time rules, mix in some cards from Enchanting Tales, Knightly Tales, and Animal Tales, along with the brand new Fairy Tales expansion, house rule that all stories are going to feature our favorite mismatched duo of Princess and Wolf, and we’re good to go. Someday, maybe, she and Wolf will actually come face-to-face with the Winter King, and she’ll finally have a chance to rescue her family, whose hearts have been frozen against her. But we’re in no hurry. Each new expansion gives us new stories to tell, and it’s the stories that count. 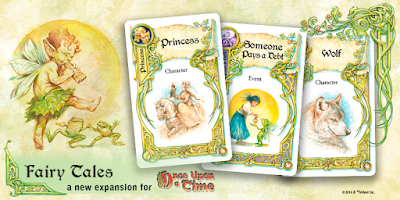 Fairy Tales is available now wherever you can buy Once Upon A Time.